HammerCon IV, Southern Ontario's largest game convention for gamers by gamers, is this weekend at the Crowne Plaza in downtown Hamilton, Ontario. 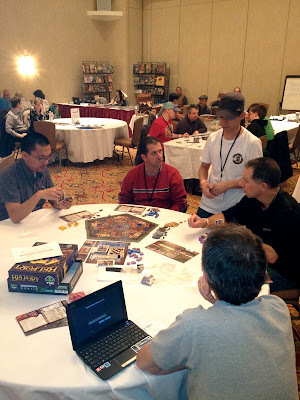 The convention features a variety of roleplaying, board games, LARPs, tournaments, and Protospiel North designer event. If you do come, please stop by and say hi. I will be running the Great Canadian Board Game Blitz on Saturday from 1-8pm. Otherwise, you can probably find me in Pavilion "A" where the Protospiel North events (board game designers) will be happening. Hopefully I will make a few posts this weekend, and get some exclusive interviews with board game designers over the next couple of days. Stay tuned!